This is just a quick rundown of everything I could think of that in MY experience should help you get a better idea of how to use a board EFFECTIVELY. Please keep in mind, this is NOT a list of things that you can do to help you use the board SAFELY. We have no idea what’s behind the board. Protecting yourself against the unknown, and being safe when dealing with the unknown is something that is impossible to be truly sure about. ~ Some people use the board alone. Some people say it’s best to have two people, a male and a female. Some say to sit facing each other with your knees touching and the board on your lap. Look, I’ve used the board under all circumstances with multiple partners, and I didn’t even get any diseases. In my experience, none of it matters. I think it’s all about personal preference. I never use the board with more than 2 people using at a time, someone else and myself. I don’t even like to have others in the room if I can help it. It just makes things run smoother FOR ME, and it’s less confusing for all involved. YOU may want to handle things differently. Do your own thing. ~ PRACTICE! When beginning to use the board, for a lot of people, the planchette moves very slowly. Whatever you’re speaking to misspells everything. Sometimes it’s hard to understand what the board is trying to say, or it could be lying about everything. Sometimes it will say mean things, and spell out the word ‘die’ or some other scary thing. If you are intimidated by this sort of thing, the board is not for you. Go play Playstation. If you can get passed that, you need to practice using the board more regularly. In my personal experience, the more you practice using the board, the better the communication will be. Things will become more coherent, friendly, and easier to decipher. ~ Have an open mind. If you believe the board isn’t going to work, or its use will result in a bad experience then you’re probably right. ~ Choose your partner carefully! I can’t stress this enough. Don’t use the board with a stranger. Make sure it’s someone that you know, and trust. This way, you can be certain of your partners intentions, as well as their seriousness, and sense of ethics when it comes to the whole thing. You don’t need some moron on the board with you. Non-believers can ruin the whole experience. Also, flaky people can too. You know what I mean? These are people that hear the cat meow, and say the board made it happen. Every small draft, or noise in the room is something caused by a spirit, or the board! Why? Because THEY say so. Avoid these people. ~ Prepare for the experience. Decide with your partner what you wish to gain from this experience. Think of some questions, and write them down. If you can’t think of a good reason to attempt communication, or any decent questions to ask, you have no business using the board in the first place. ~ I don’t know your religion. For all I know, you could worship, and pray to dog poop. Before getting into using the board, and in accordance with your religion, you MAY want to say a blessing or a prayer, cast a circle, or clean the dookie. Do whatever you have to do to FEEL protected. I stress the word FEEL because, again we’re dealing with something that NOBODY truly understands. There is no solid evidence that you’ll be protected from anything. But… It can’t hurt. Can it? ~ When you begin, make sure that you tell the board that ONLY positive experiences will be permitted. The moment things become negative, you will terminate communication. ~ Only one person should be asking questions at a time. Things can get confu sing, otherwise. ~ DO NOT BE FEARFUL! 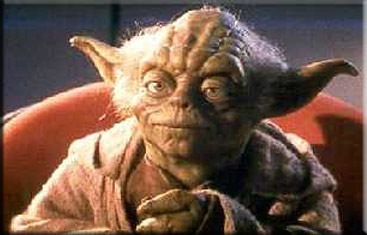 One thing that I’ve learned from Yoda, is that fear leads to the dark side. If you go into it with negative fearful vibes, that’s EXACTLY what you’re going to get back, but worse. Just make sure you have a positive attitude. ~ Take it seriously. Don’t sit there, and laugh the whole time, and make ‘scary’ noises to freak people out. On the other hand, there’s a flip side to that coin. Don’t be TOO serious. When people take things too seriously, negative feelings can easily become involved, and you don’t want that. Fly casual! ~ The board is not your friend. It is not your enemy. It is your total stranger. Treat it as such. Be courteous, and polite as you would to a normal person. ~ Whatever you’re speaking to on the other side of the board, ALWAYS assume that it’s potentially dangerous. ~ Don’t accuse people of moving the planchette. Everyone touching the thing is pushing it. This is a stupid argument, especially when you consider the next tip. ~ Get the planchette moving yourself. Yup, you heard me right. Go ahead and push it. Get you, and your partner in a flow where it’s moving smoothly. ~ Don’t be overzealous. Start with simple ‘yes or no’ questions until things become easier. You’ll have to be patient because it might take a while to get answers at all. Once things start flowing smoothly, then you can get more complicated. ~ Keep control of the situation. Don’t allow the board to dictate to you, and don’t believe everything it tells you without some solid evidence. Wishy washy people SHOULD NOT use the board. You need to be strong, firm, and assertive. Don’t be passive or aggressive. ~ If the board begins saying things or doing things that make you the slightest bit uncomfortable, say ‘Good Bye’ and put the board away. ~ When the board says ‘Good Bye’, let it go. Don’t keep trying to communicate. When you’re finished, you should also say ‘Good Bye’. These are things that you should NEVER do when using a board. ~ Don’t be drunk or high on some crazy drug. Moron. ~ NEVER ask the board when you or anyone else is going to die. Why would you want to know such a thing? What’s wrong with your brain? ~ Don’t tell the board to move something in the room, or ask for physical signs. See, now you’re literally asking for trouble. ~ NEVER invite a spirit or whatever it is to come home, or stay with you. ~ Don’t tell the board to curse, or hurt someone else. If you want to do that to someone, you belong in prison. ~ Don’t play while sick. In your weakened and sickly state, you could be taken advantage of by something out there in The Beyond. They might be able to make you do THINGS! ~ Don’t use the board as a tool to mess with peoples heads, and try to scare them. That’s just mean, man. 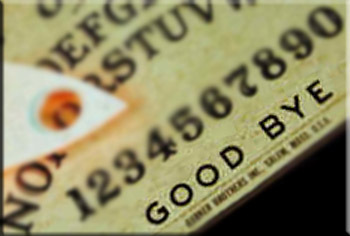 ~ OUIJA BOARDS SHOULD NOT BE USED ON SCIENTIFIC INVESTIGATIONS! There is no scientific credibility in a board. Nobody KNOWS what’s behind a board, whether it be positive or negative. NOBODY with credibility themselves can claim to possess that knowledge.